Are you a golfer? If you are, this golf card is for you! 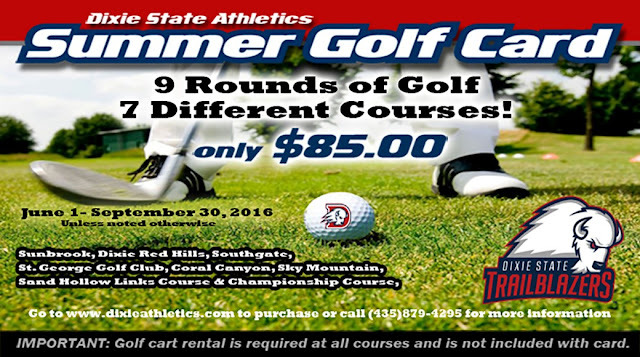 This is a fundraiser for Dixie State University's athletics department. This card costs $85 so that means you end up saving over $400! The golf courses accepting the Summer Golf Card are: Sunbrook, Dixie Red Hills, Southgate, St. George Golf Club, Coral Canyon, Sky Mountain, and Sand Hollow (Links Course & Championship Course). Valid June 1st - September 30th.